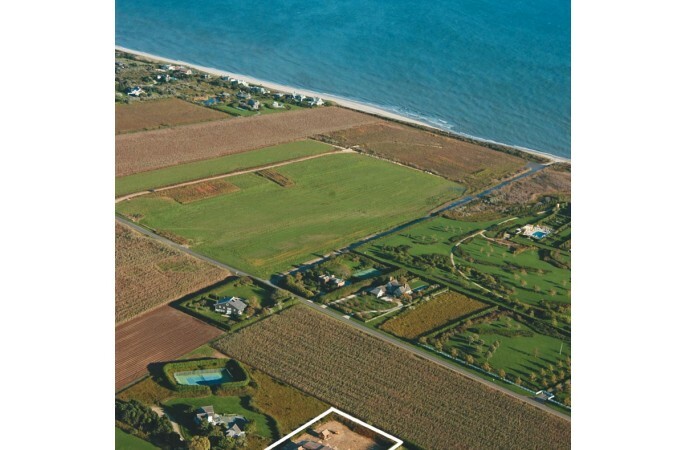 Another wonderful creation is taking form under the watchful eye of Simon & Simon Properties on 1.5 bucolic acres midway between Hedges and Daniels Lane overlooking vacant farm fields to the Atlantic Ocean beyond. Ready for Spring 2007, this 8,000 sq ft shingled residence will offer 7 bedrooms, including masters up and down, both with fireplaces and 3 additional ensuite guest bedrooms. The majestic foyer opens to a grand great room with fireplace, a paneled library, formal dining room and gourmet kitchen with butlers pantry and nearby staff quarters. An expansive lower level with fireplace includes staff suite, wine cellar and room for gym and recreation rooms. An elevator services all 3 levels of living space. Unfinished space above the 2 car garage could be perfect for the gym. Outside the pool house overlooks a 25 X 50 gunite pool and spa, generous lawn and perhaps a future golf hole.